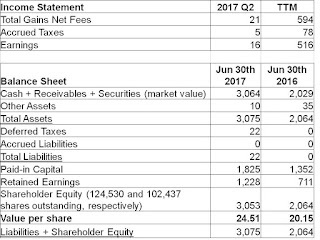 For the second quarter ended June 30th, 2017, KVF gained $0.13 per share, increasing the value of each share to $24.51. Currency headwinds reduced quarterly earnings by $0.24 per share. Currency effects are likely to continue to play a large role in quarterly results; but over the long term they have tended to cancel out to a large extent, and that remains the expectation going forward. This result was in line with that of the S&P 500, which was up in the low single digits, and a hair better than the S&P TSX, which was down in the low single digits. Despite the similar performance this quarter, these indices do not do a good job of describing any part of KVF's portfolio. (Thanks to rising US large-cap stock prices, it's possible that KVF's portfolio no longer contains a single S&P 500 component at the moment.) I simply mention these indices quarter after quarter as they are common alternatives as investments, and so comparison to them may be warranted for that reason. Were it not for the fortuitous buyout of Canam (discussed here), it would not have been a good quarter for KVF. On the other hand, were it not for the political crisis in Brazil, it would have been a much better quarter for KVF. KVF's only Brazilian holding, Gafisa, has gotten clobbered thanks to the bribery scandal that rocked the country and sent prices lower. 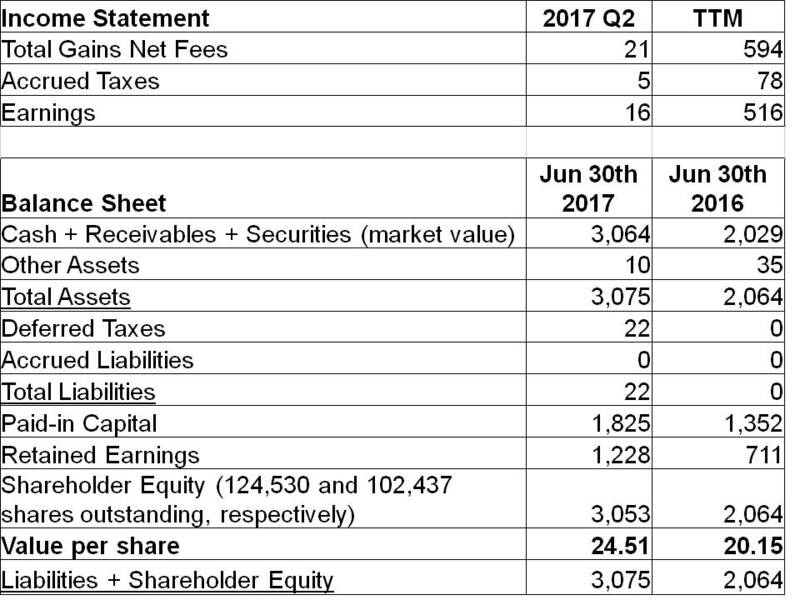 I remain confident that the company's management is competent and is shareholder friendly, so KVF continues to hold these shares, though exposure has been reduced significantly in the quarter due to Gafisa's cash spin-off of Tenda to ADR holders. With interest rates staying so low for so long, it continues to be difficult to find value. KVF's small size, however, gives it a large universe from which to choose. The focus right now remains on idea generation in order to keep cash levels from rising too high while simultaneously not raising the portfolio's downside risks.